Don't miss timeanddate.com's LIVE broadcast of the annular solar eclipse on Sunday, February 26, 2017. We start streaming at 12:05 UTC, just before it starts as a partial eclipse in the Pacific. We will keep streaming as the eclipse moves over parts of South America and until it ends in Africa at 17:35 UTC. Weather permitting, you will be treated to close-up images of this spectacular astronomical event for several hours. An annular solar eclipse is when the Moon covers only the Sun's center, creating a “ring of fire,” or annulus, in the sky. 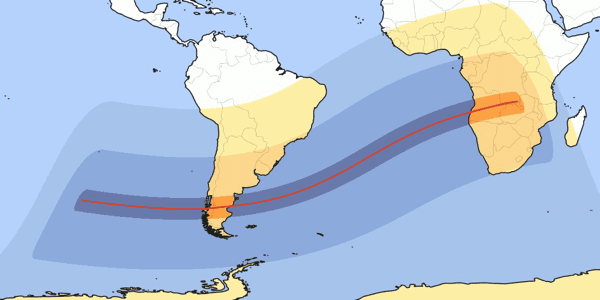 This annular eclipse will be visible along a path stretching from parts of the Pacific via the southern tip of South America to southern Africa. Check out our animation of this eclipse and other eclipses worldwide in millions of locations from the GeoNames database. If you are lucky enough to be watching this solar eclipse in person, make sure you use proper eye protection. It's not too late to make your own eclipse projector. 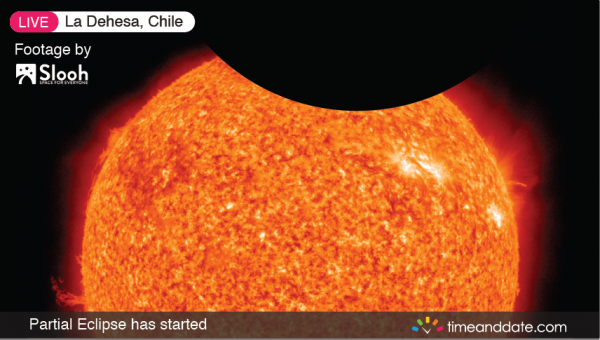 For this eclipse, timeanddate.com is sponsoring an educational project with astrophysicist Graham Jones to bring you live images and info about solar eclipses.